Like most quartz minerals, amethyst is found all over the world. 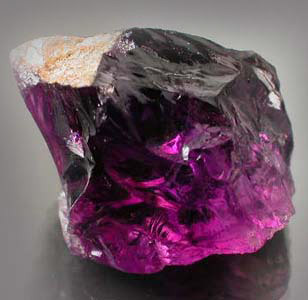 The finest amethysts are found in Uruguay, where it is the national gemstone. It is also found in Brazil, Russia, India, Zambia and Namibia. Amethyst can be found anywhere where lava has been close to the earth’s surface. Scientists believe that amethyst is formed in two stages. 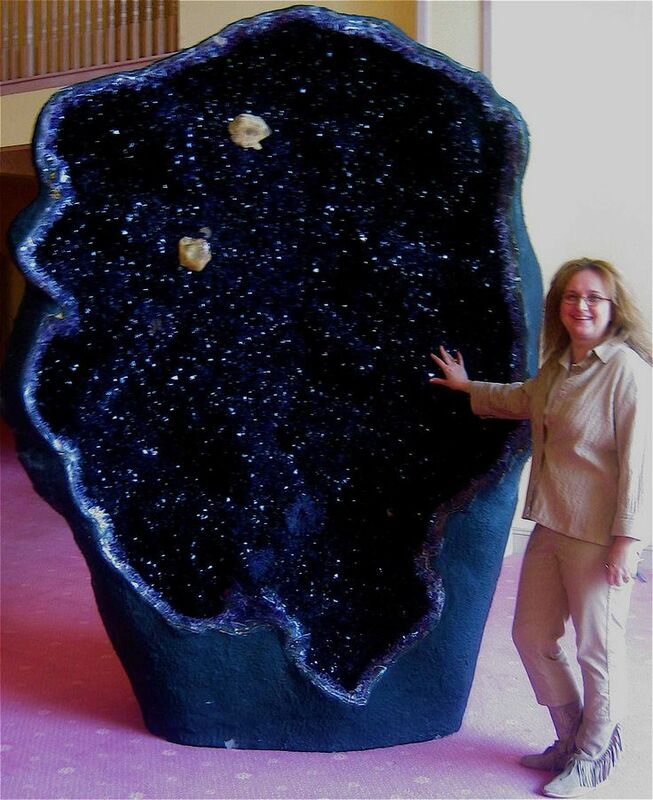 Firstly, an amethyst geode is formed from gas bubbling and being captured in the lava, causing cavities. The cavities then fill up with a liquid that contains a small amount of iron, which over time forms amethyst crystals. 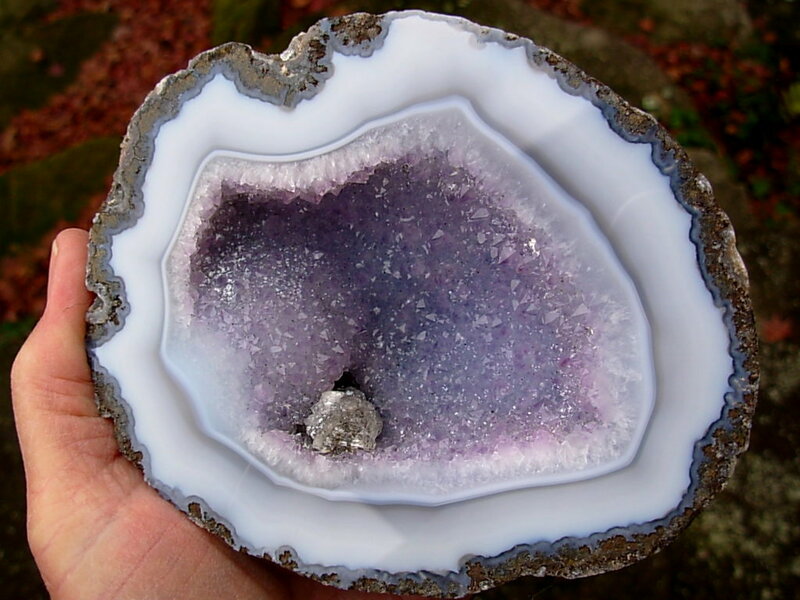 The geodes look very plain on the outside but when cut open they reveal a spectacular display of amethyst in the middle. These geodes can be found in varying sizes. 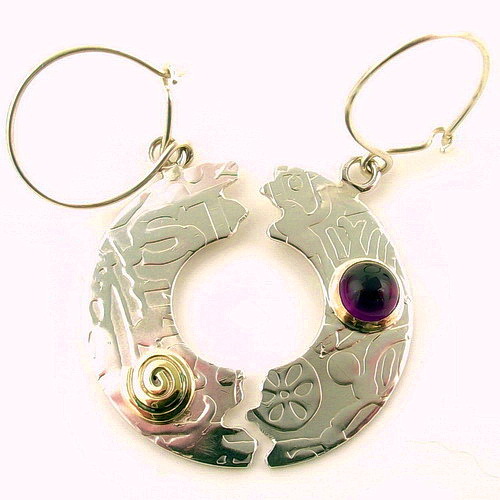 We use amethyst often in our jewellery. We love the rich, purple colour. Below are some examples of amethyst in our work. 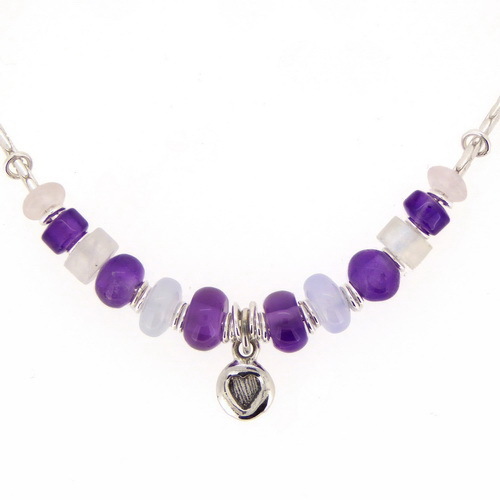 One of our heart necklaces with amethysts. John and Dawn Field. 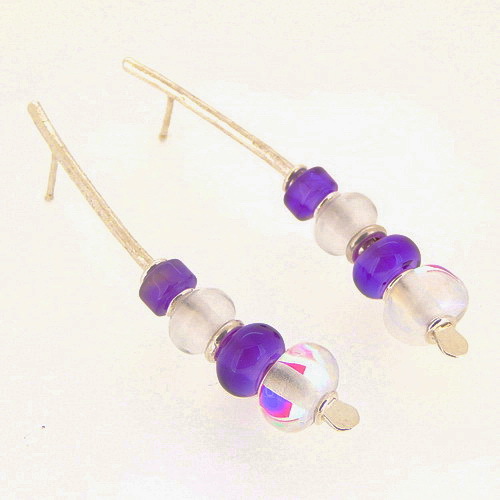 Amethyst extra long asymmetrical earrings. 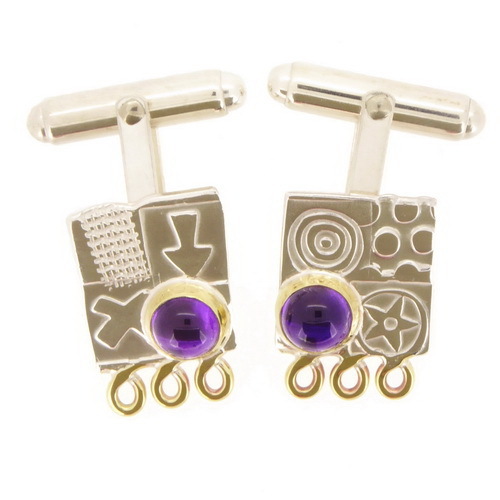 Amethyst cufflinks from our new Matching range. 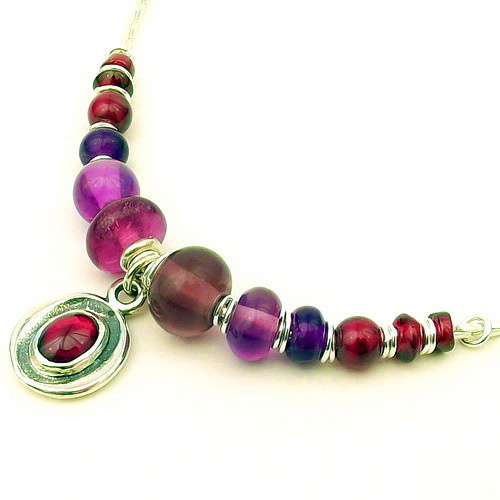 Our garnet and amethyst necklace from our gemstone range. 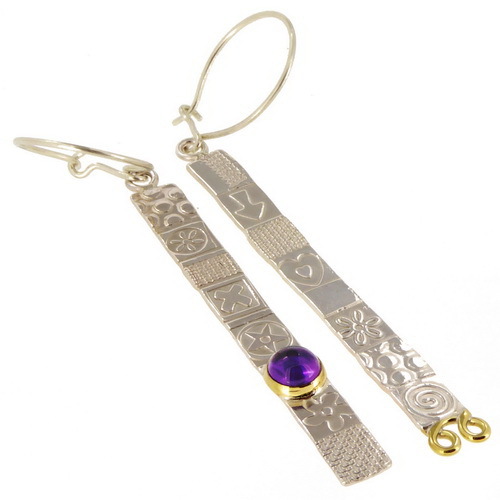 Halved amethyst earrings from our Imprint range. Garnet = January’s birthstone of the month. 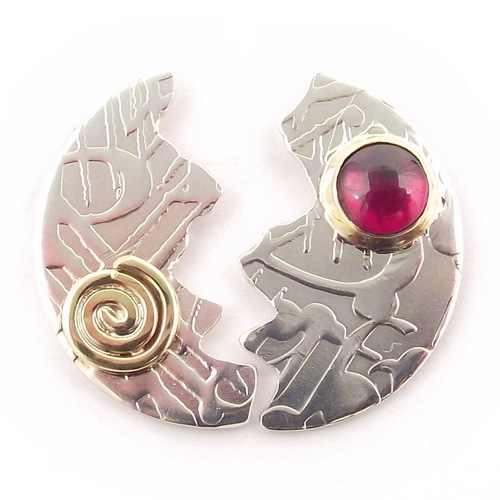 John’s one-off sculptural Man stand with garnet earrings. 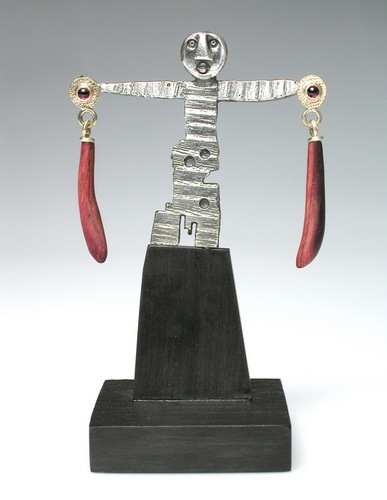 John’s man stand sculpture with garnet earrings. 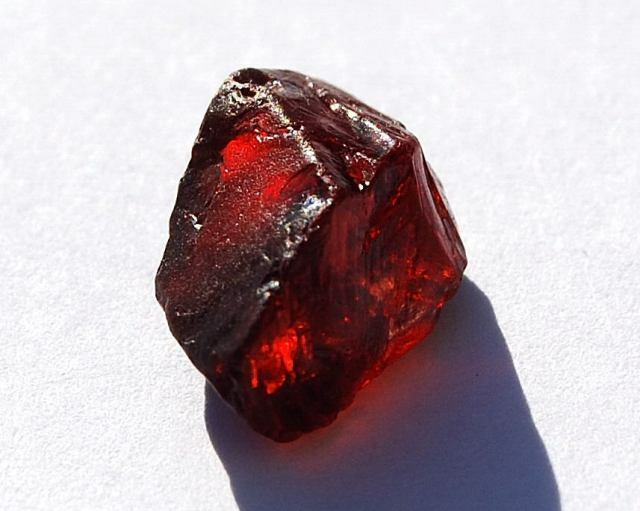 British birthstone of the month, January = Garnet. 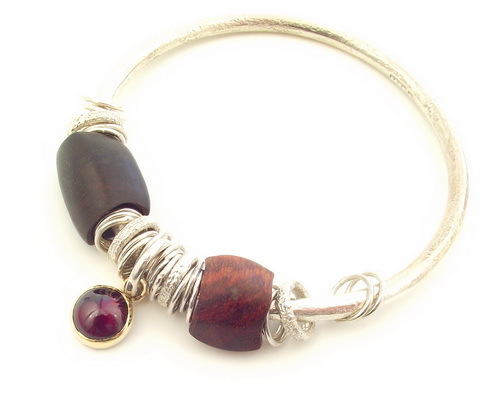 We love to make jewellery using garnet stones. The deep, rich colour gives a feel of warmth and luxury to our work. 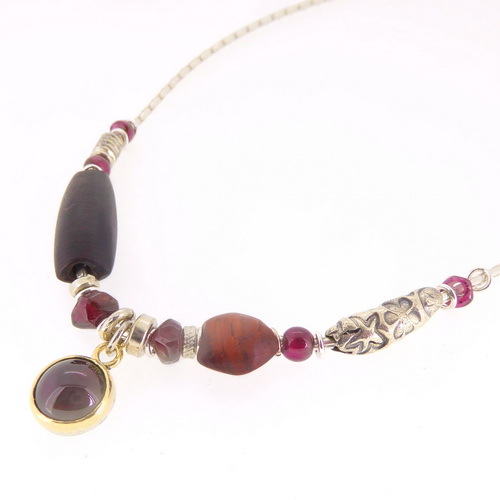 Our one-off garnet necklace uses a number of different shapes of garnet stone. One of our beautiful bangles, featuring a set garnet in 18ct.gold and carved exotic wooden beads that are hand carved by John. This ingenious little piece of work is one of John’s one-off pieces. John often makes stands or display sculptures so that the jewellery can be displayed when not being worn. 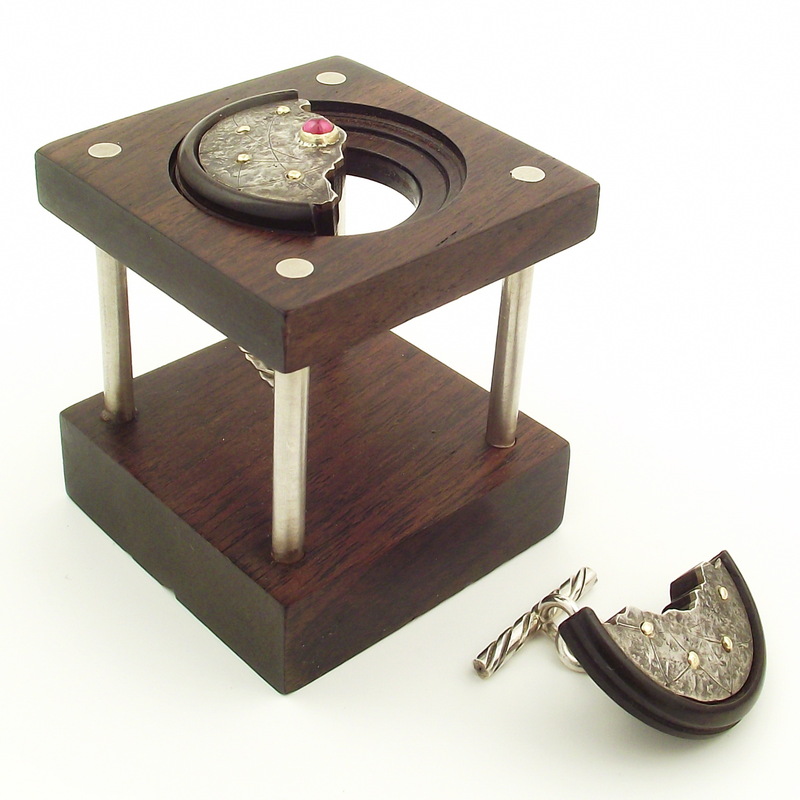 The cufflinks are made from sterling silver, 18ct.gold, garnet and African blackwood. 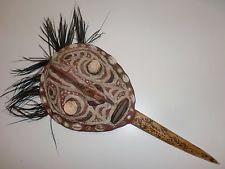 The stand is made from African blackwood and silver. This stunning necklace is made from Sterling silver, 18ct. gold, garnet, sea bamboo and hand carved African blackwood. 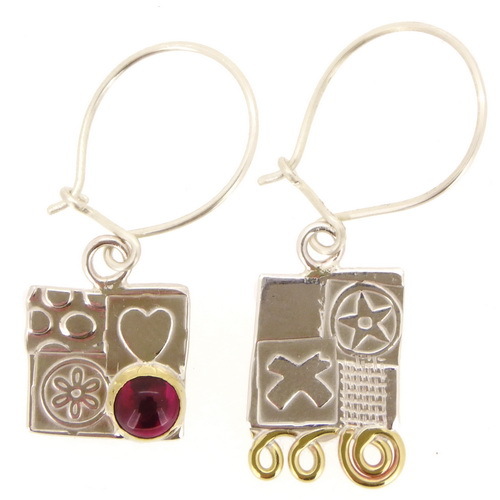 Our small asymmetrical earrings with a garnet cabochon stone. Our halved disc ear studs, featuring a garnet stone from our imprint range of jewellery. 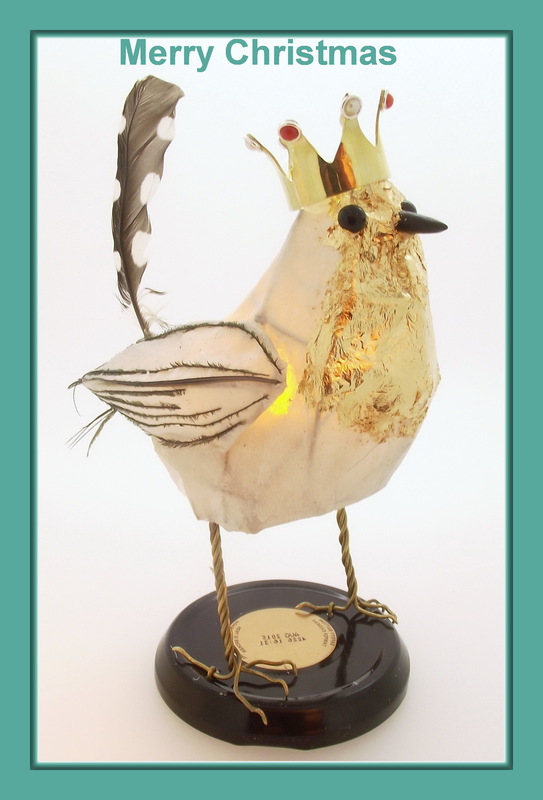 Robin redbreast Christmas lantern made by Dawn. A Christmas necklace, plus FREE gift of our small hoop earstuds with every website purchase. John made this beautiful necklace for an exhibition. The theme was to make a piece of work to celebrate the gallery’s fortieth birthday. We think that it looks ever so Christmassy. This elegant necklace is made from Sterling silver, 18ct. 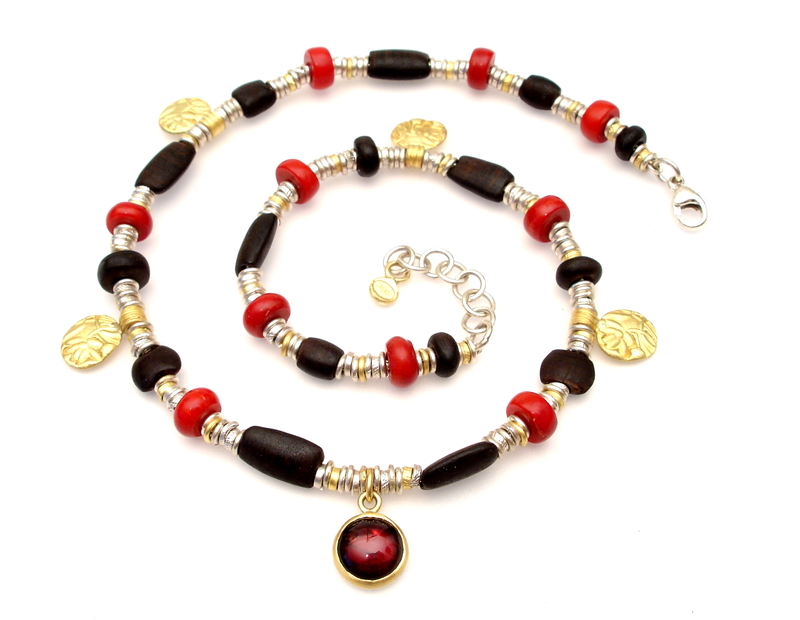 gold, garnet, sea bamboo and hand carved african blackwood. OUR SPECIAL CHRISTMAS OFFER – A FREE PAIR OF OUR SMALL HOOP EAR STUDS WITH EVERY PURCHASE. Offer ends 31st December 2016. Our small 8mm textured sterling silver hoop ear studs. Our elegant hoop earstuds come in a branded John and Dawn Field box. We wanted to get into the Christmas spirit, so with every order from our website, our customers will automatically receive this special gift from us. Please order by Wednesday the 21st of December for guaranteed U.K. delivery by Christmas. 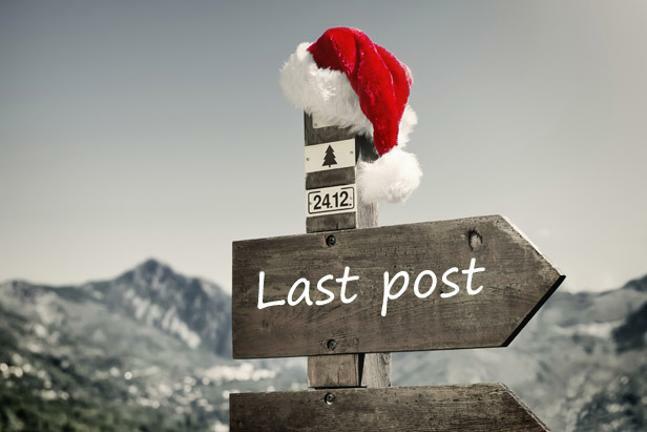 For last day Christmas deliveries to other countries, please e-mail us and we will let you know. British birthstone of the month. December = Turquoise, plus our new turquoise necklace. 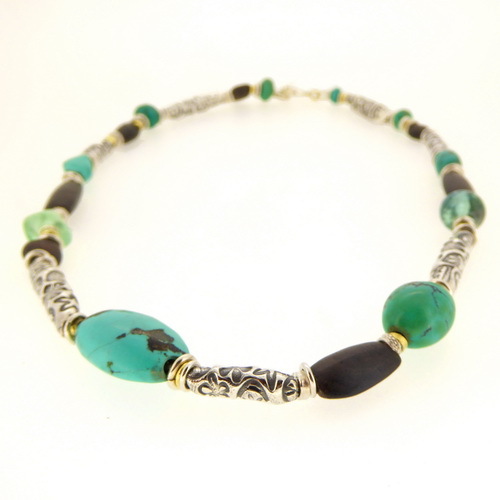 Our new, stunning Turquoise necklace. 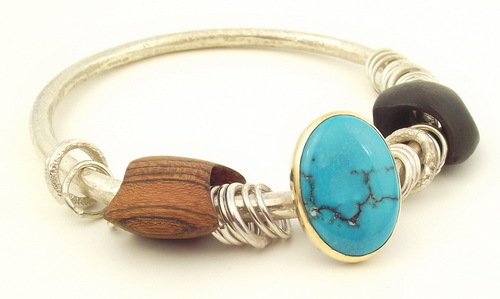 Turquoise, Sterling silver, 18st.gold, fluorite and hand carved African blackwood. Our new turquoise and African blackwood necklace. We thought that the mixture of our silver tubes and hand carved African blackwood, interspersed with little dashes of 18ct.gold, worked wonderfully with the turquoise to create this stunning necklace. The substance that we now know as turquoise has been treasured for many years under different names. The word turquoise dates back to the 17th century, when the mineral was brought into Europe from Turkey. The word Turquoise is derived from the French word “turques” for “Turks”. Turquoise is a blue to gray-green mineral consisting of copper aluminum phosphate. 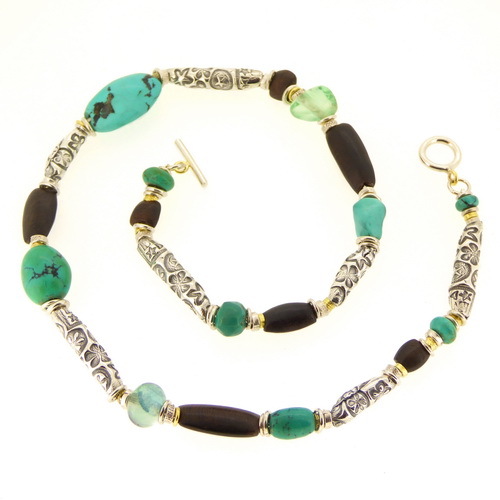 Turquoise is formed in drier climates, in rock formations that originated from volcanic activity. In some areas water worked its way through porous rocks and left behind minerals such as copper, Iron and aluminium and through two natural processes, weathering and oxidation, turquoise is formed. It can usually be found as incrustation in cracks or as nuggets. Copper gives the mineral its blue coloring. 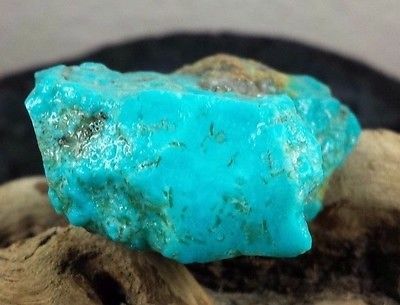 If there is more iron present in the mineral then you get a greenish turquoise and if there is more zinc then a yellowish turquoise colour is formed. Veins are often found in turquoise, this pattern is called a matrix or webbing. The veins are the remnants of the rock that originally hosted the turquoise and through millions of years of weathering and oxidation it is formed into veins. 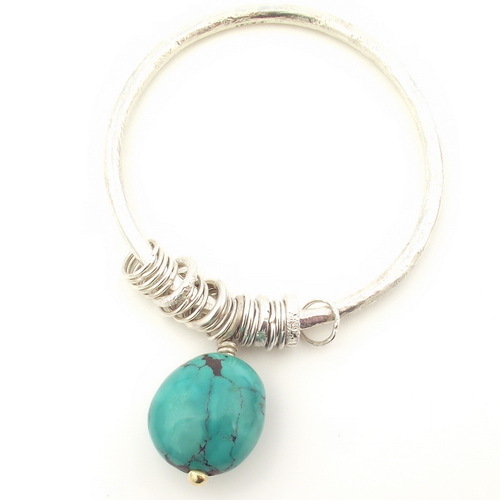 We love to use Turquoise in our jewellery, it’s one of our favourite stones. One of our bangles. Sterling silver, 18ct. gold, Veined turquoise, hand carved Wenge and African Blackwood. 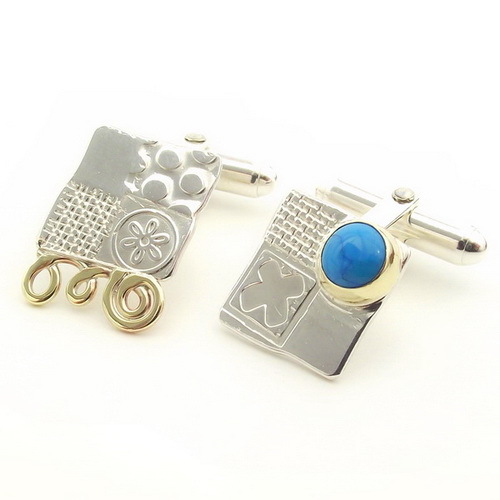 A pair of our Asymmetrical cufflinks. Another one of our turquoise bangles. Sterling silver, 18ct.gold, veined turquoise. 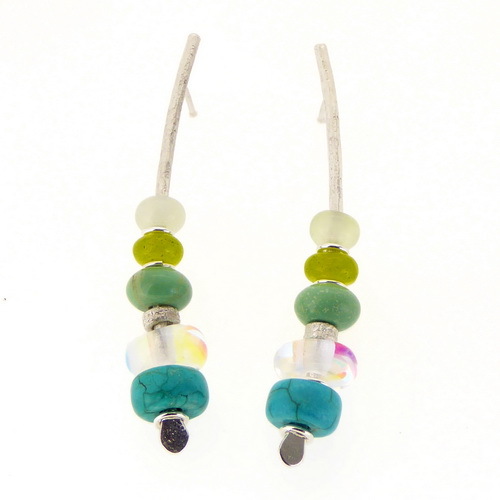 Our large arc earrings use two different colours of turquoise. 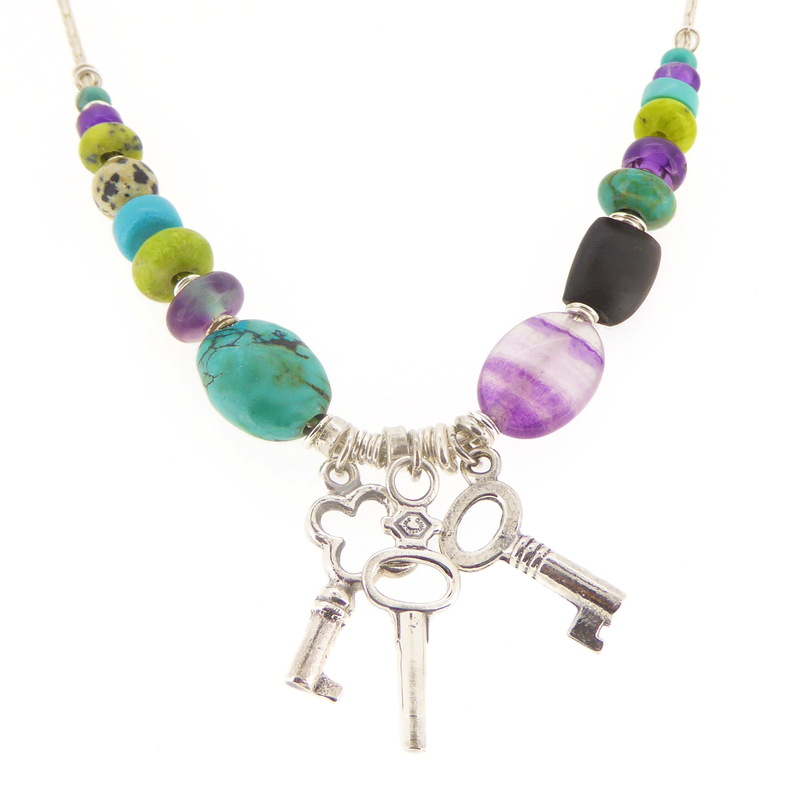 We often use lots of turquoise in our key necklaces. 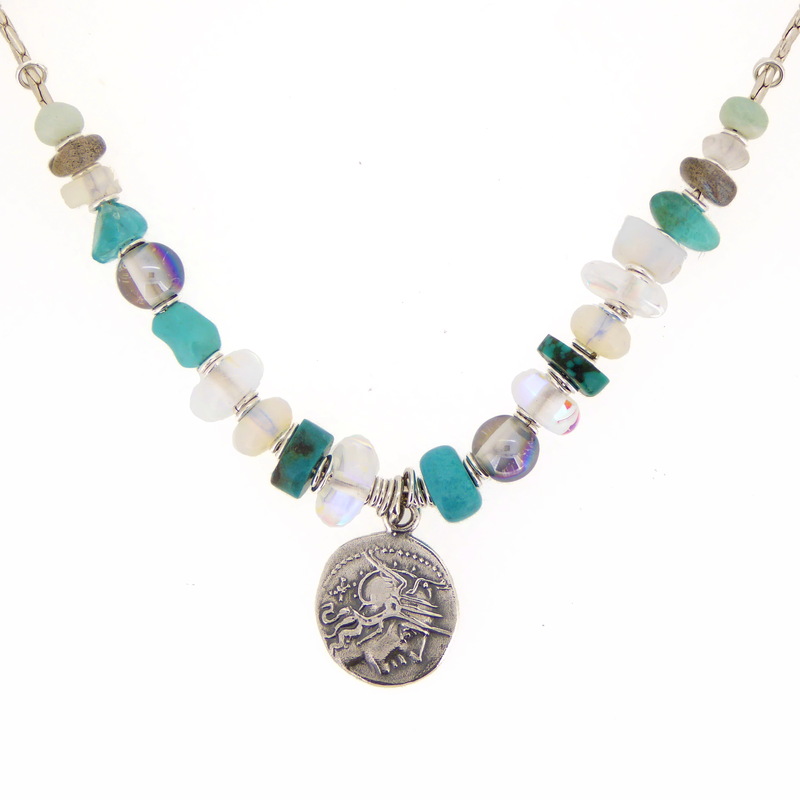 Coin necklace with various turquoise and other stones. All of the above jewellery can be found on our website, including our wonderful new necklace. New cufflinks and matching His and Her jewellery. 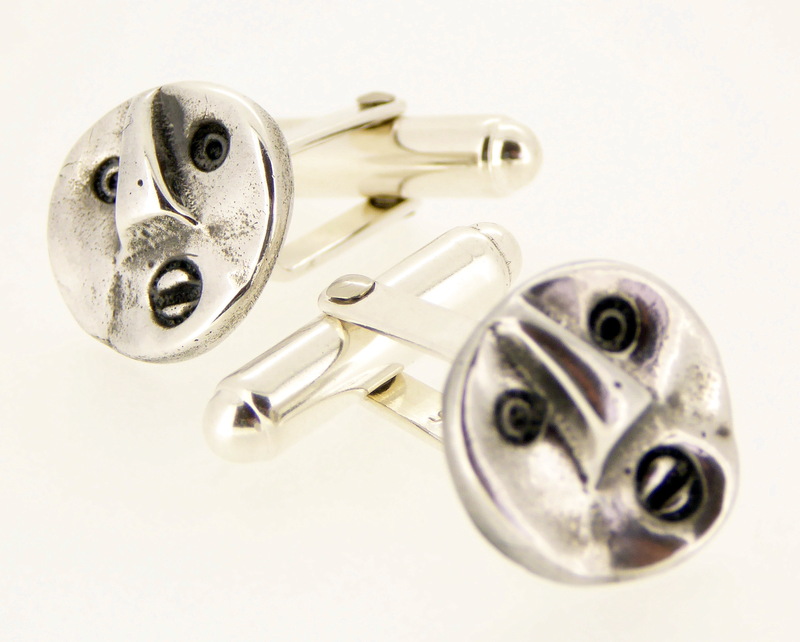 These new cufflinks are on show at the Dazzle Oxo Tower Christmas exhibition and have now also been added to our website. 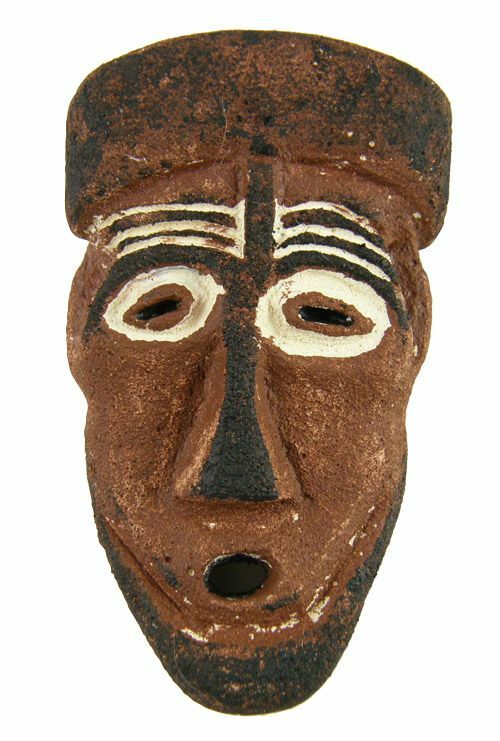 These new “Face” cufflinks are great fun and we are having a wonderful time developing ideas for them, as you can see below. 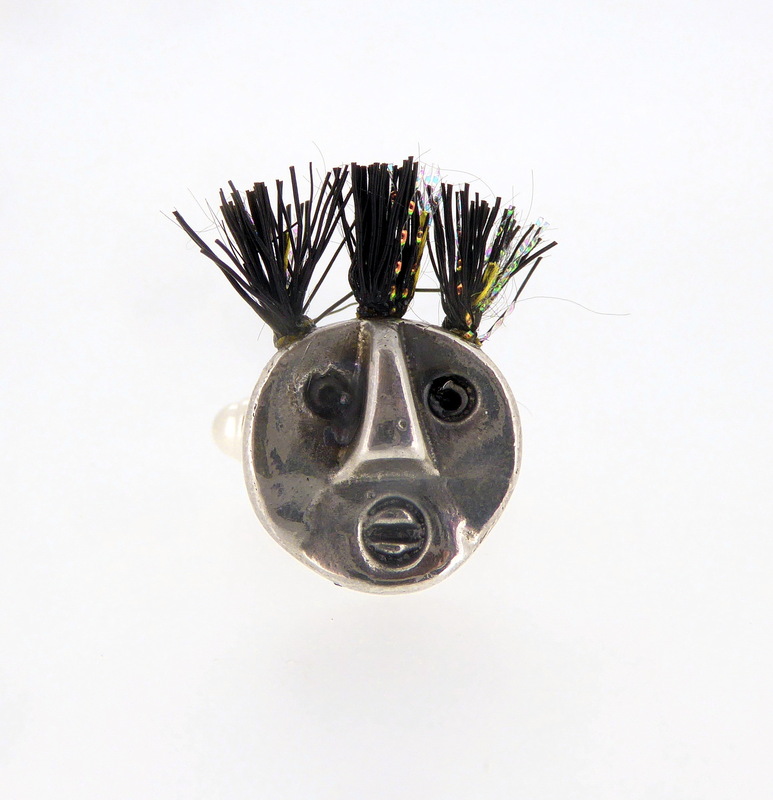 Our new Face cufflinks, now with hair! 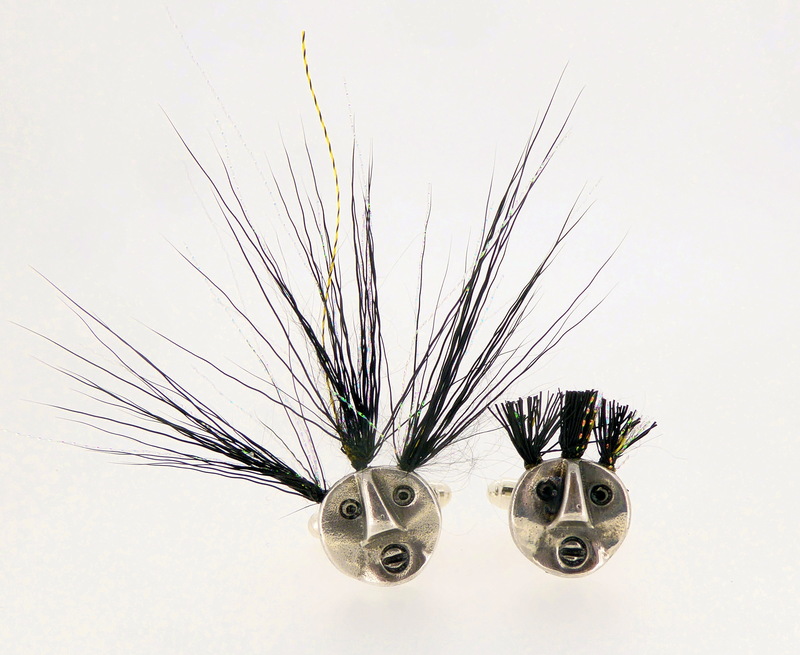 Although we like our little bald-headed cufflinks, we thought that they would look even more charismatic with hair. 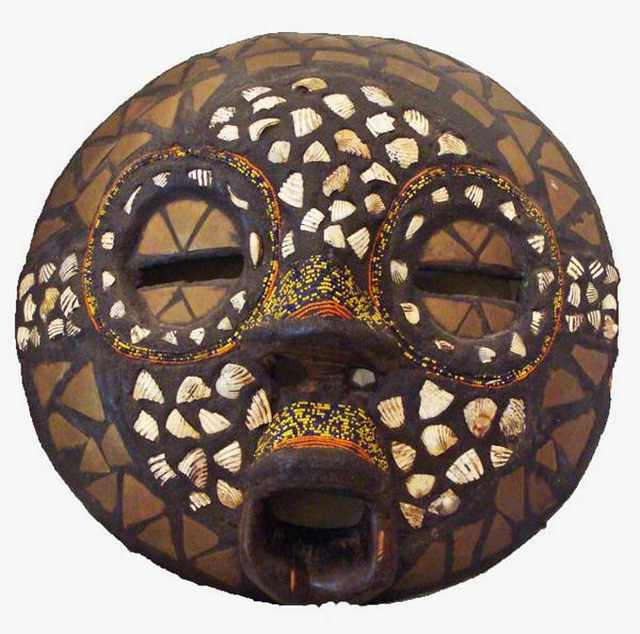 This also fits in with the tribal look of African masks that we had seen in various ethnographic museums, which originally inspired the cufflinks. Getting the right kind of hair is proving to be a challenge. We have tried different materials including fur, which looked wonderful but fuzzed up very quickly. Silicon rubber strands were interesting, as they are available in all kinds of wonderful colours but these broke if stretched too much. 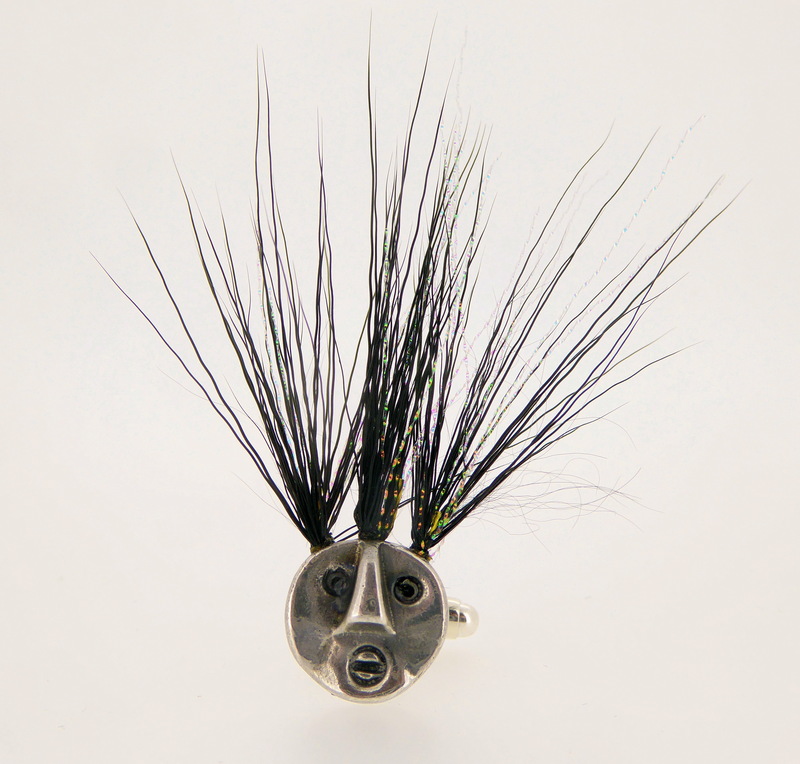 We have finally settled on wild boar hair. It is tough and rigid enough to be practical, it is not too bristly and it doesn’t fuzz up. Our new hairy cufflinks, before and after a trim! Unfortunately, they have had to have a trim. Although we really love the long-haired version, they would be very impractical to wear as cufflinks, so it was time for the chop! We are coming up with other ideas for using the long-haired version though. One includes John’s idea for a little kinetic art figure so watch this space. Although he has had to lose a lot of his locks we still think that he looks like a real character! John is now wearing the cufflinks to test them out before we let them loose in to the world. 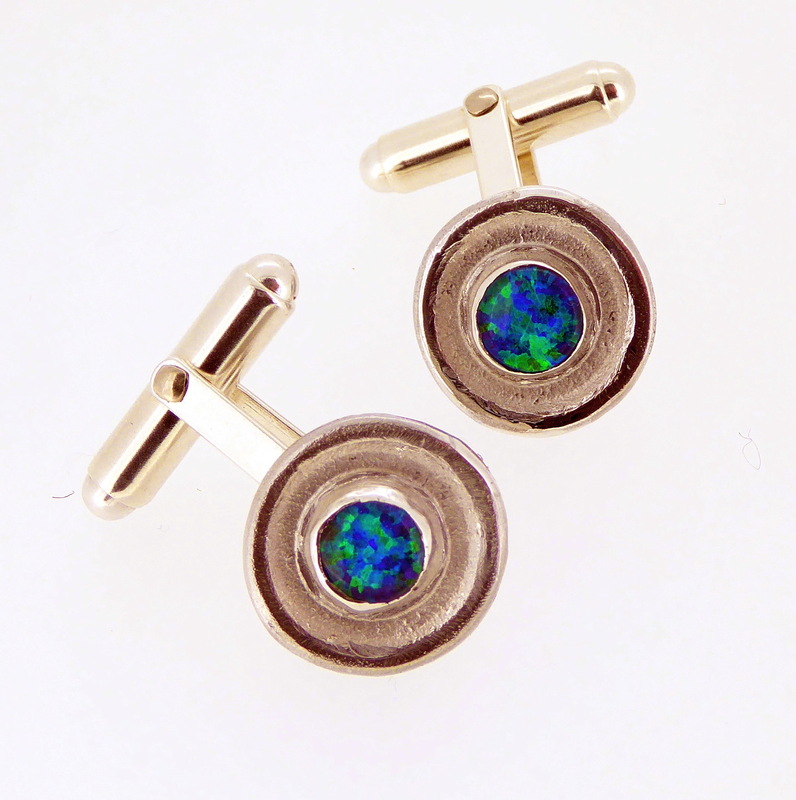 Our new 6mm Cabochon cufflinks. 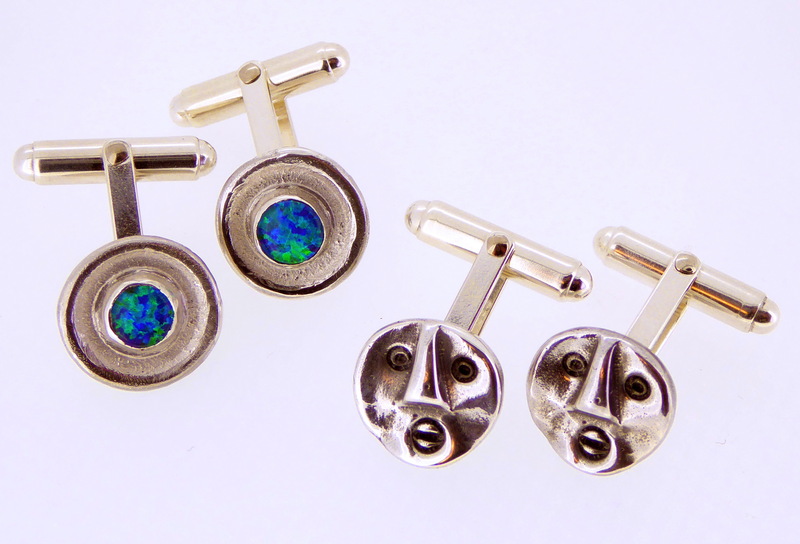 We love the simplicity of these cufflinks and because of their simple design, the opal triplet stones are shown off at their best. On our website there is also the option to choose from eleven other different stones. We occasionally get asked to make matching His & Her jewellery, especially for weddings, so we thought that matching earrings would perfectly complement the 6mm cabochon cufflinks. His and Her matching cufflinks and earrings. 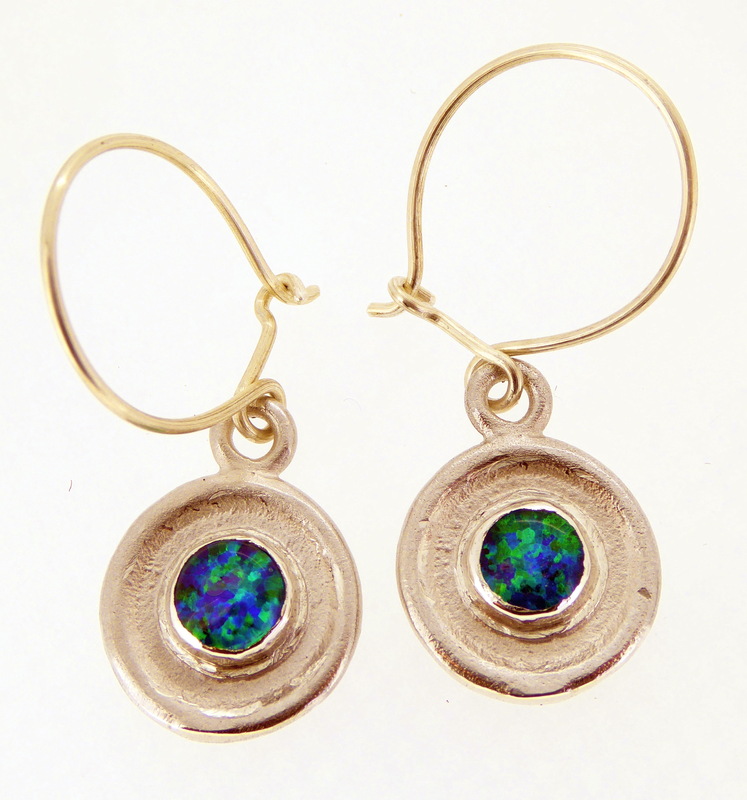 New 6mm cabochon opal triplet earrings. 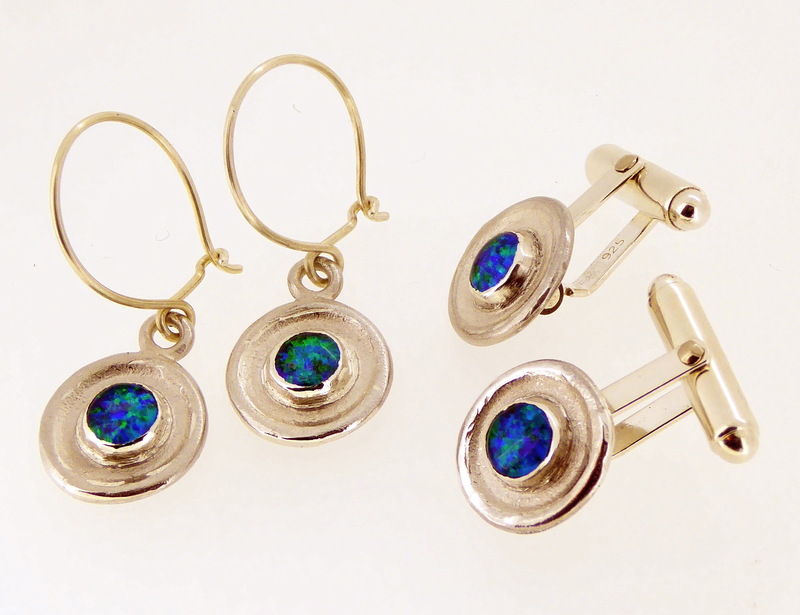 As with the matching cufflinks these earrings can be made with other choices of stones, including amethyst, amber, pink corundum, other colours of opal and more. For a full list please check out our website.